This item is replaced by an adhesive attached version instead of magnetic. We currently cannot locate any magnetic backed fish with cross that meet our quality standards. See the alternative below. 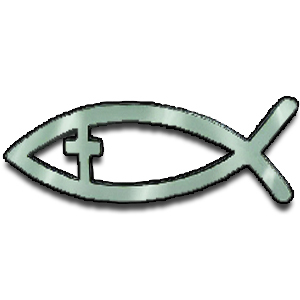 Christian Fish with Cross Emblem - Large - Magnetic The fish is a sign that Christians have used to identify themselves to one another throughout history. Durable and flexible magnetic material 3 dimensional fish emblems are the perfect witnessing tool on your automobile. Glossy fade-resistant foil finish. Fish emblems are 5 1/2" x 1 3/4" and attach to any flat metallic surface without adhesive.